Let’s just say, I hope you are ready to learn the broomstick lace stitch. It’s really lovely when it comes to texture & eye-appeal. 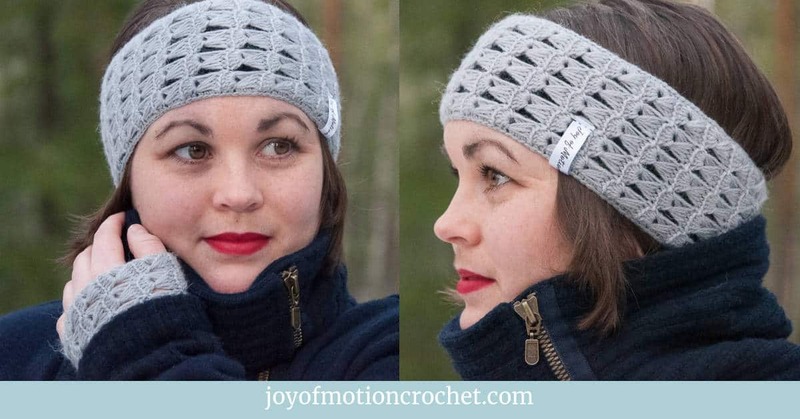 The interesting thing about this stitch is that you will be needing not just the crochet hook & yarn. Because you’ll also need a but also a “broomstick”. The broomstick however can be anything round & long, lik a pen, a thicker crochet hook or knitting needle. How big the diameter of the “broomstick”, decides the how the outcome looks. The stitch is not as hard as it looks, & you’ll get used to using the “broomstick” quite quickly. 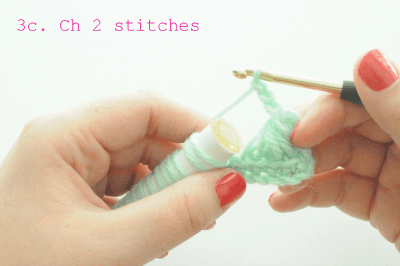 However you’ll need to know how to crochet at double crochet stitch to crochet this stitch. If you have bought one of my crochet patterns, you might wonder how the broomstick lace stich is crocheted. 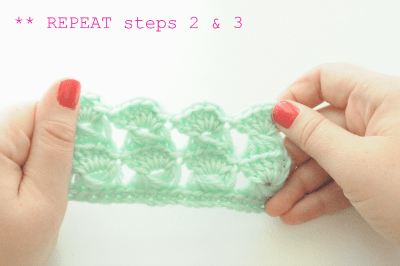 This crochet tutorial will walk you through step by step, with pictures, video & written descriptions. 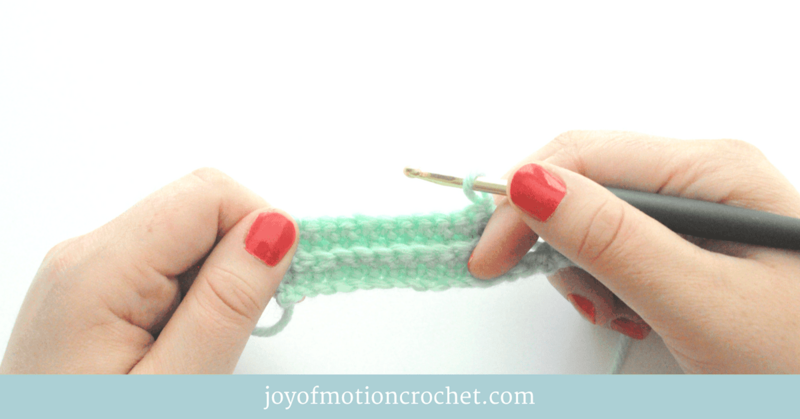 Try the crochet stitch today & find a crochet project to use it in later. On the bottom I’ve added a list of the Joy of Motion crochet patterns where the broomstick lace stitch is used. Chain as many stitches as the pattern suggest. Always chain a number that can be divided by 5, + 1 extra chain. 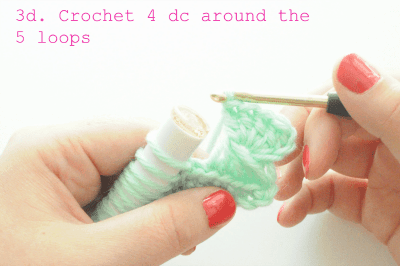 No picture – refer to “Beginners Guide to Crochet part 1“. 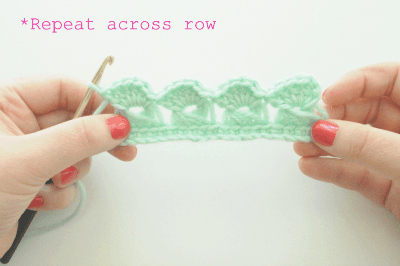 Turn your work & single crochet (sc) stitches along chain (ch) row. You are now ready to find your “Broomstick”. 2a. Move the loop from the crochet hook to the broomstick. 2b. 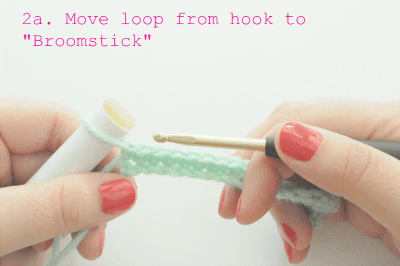 First time you do this: Move the loop from the crochet hook to the broomstick. 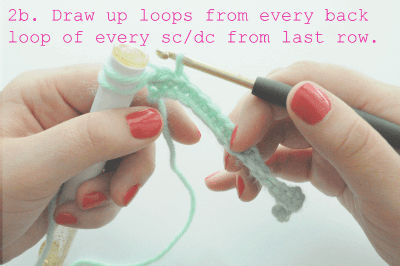 Draw up loops from the back loop of every single crochet (sc) from last row. 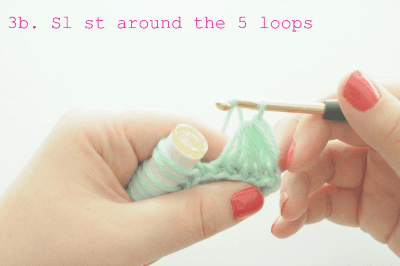 When repeating: Draw up loops from the back loop of every double crochet (dc) from last row. 2c. You have now all loops on the “Broomstick”. 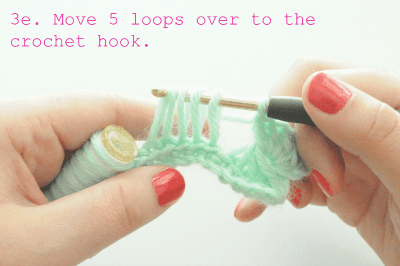 * You can choose to pull out the whole “Broomstick” or move 5 loops at the time over to the crochet hook. 3b. & slip stitch (sl st) around the 5 loops. 3d. Dc 4 stitches around the 5 loops. 3e. 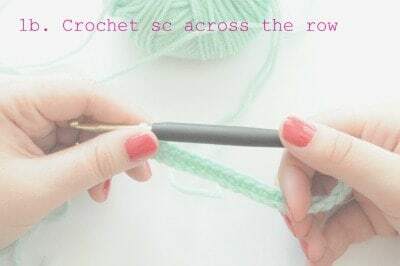 Across the row (3e-3g): Move 5 stitches on to the crochet hook. 3f. 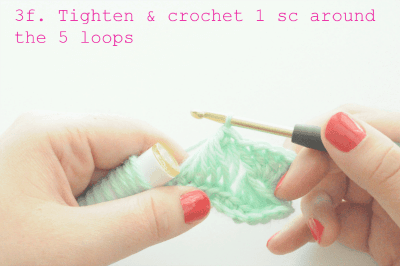 Tighten & crochet 1 sc around the 5 loops. 3g. Crochet 5 double crochet stitches (dc) around the 5 loops. *Repeat 3e.-3g. until end of row. **REPEAT number 2 & 3 until desired length. Row 1: Chain as many stitches as the pattern suggests. Row 2: Sc in 2. Chain from hook. Crochet sc in all chains from last row. Row 3: With a “Broomstick” draw up a loop and add to the broomstick from all stitches from last row. Row 4: Move 5 loops from “Broomstick” over to the crochet hook. 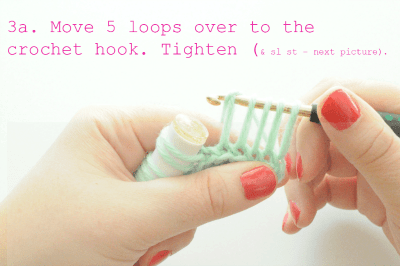 Tighten and slip stitch around the 5 loops. Chain 2 stitches. Dc 4 stitches around the loops. *Move the next 5 loops from “Broomstick” over to the crochet hook. Tighten and sc 1 stitch around the 5 loops. 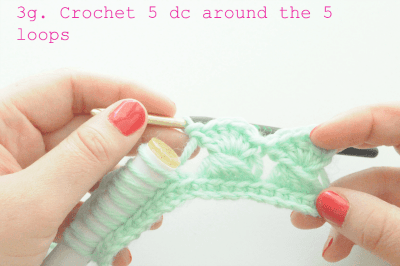 DC 5 stitches around the same 5 loops**. Repeat from * to ** until end of row. Row 5: With a “Broomstick” draw up a loop and add to the broomstick from back loop of all dc stitches from last row. Repeat row 4 and 5. 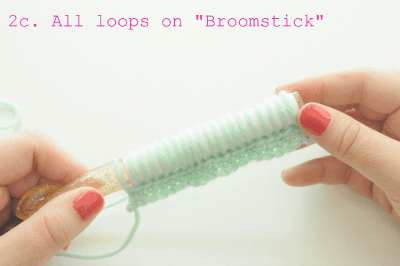 These soundless videos shows how to crochet the Broomstick Lace Stitch. 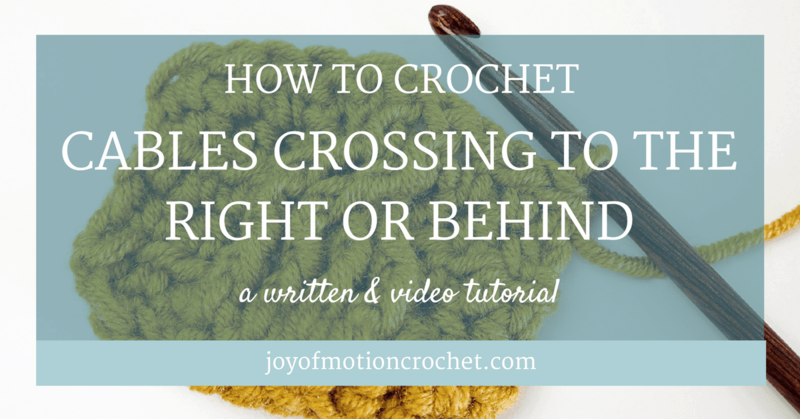 I hope you enjoyed learning how to crochet the Broomstick Lace Stitch. 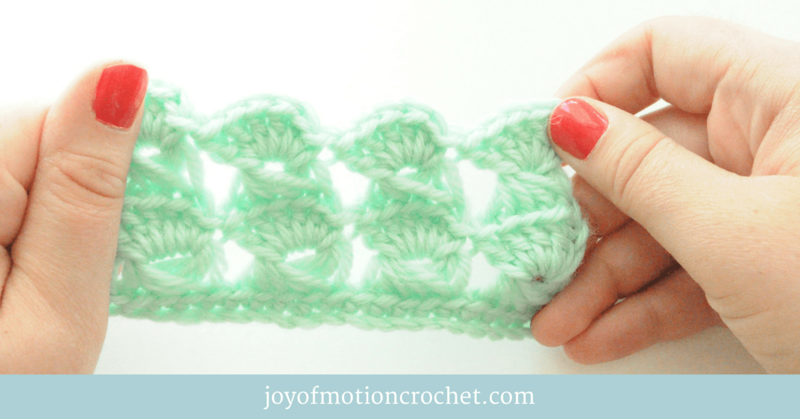 Comment below to let me know what you used the crochet stitch for, I’d love to see what you’ve made! There will also be a few crochet patterns coming using this stitch up within November.